I try hard to get a sense of a story in my images. Not to spell it out but to make people wonder what the story is and let them interpret it as they will. In this case, I suspect there is no connection between the two people. 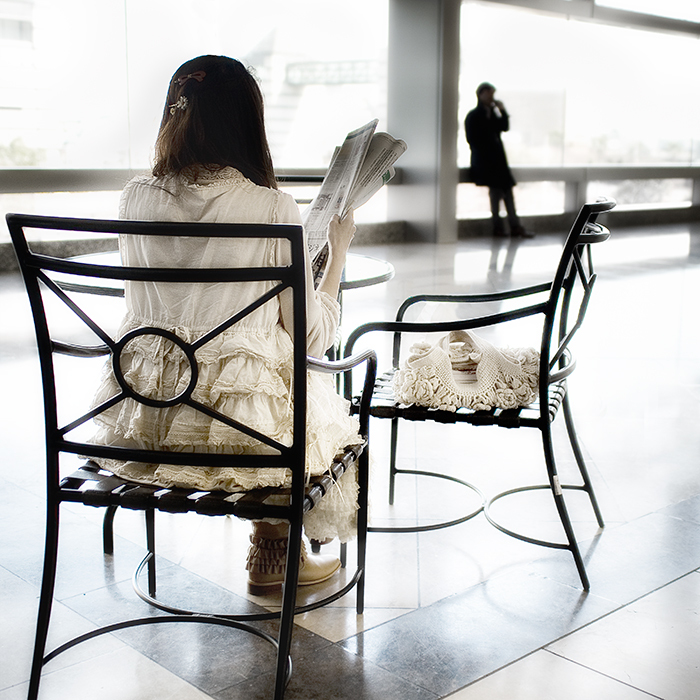 It is a candid shot taken as I was sitting in a café in Yokohama looking at the world go by and waiting for photo opportunities to present themselves (See the original image below). She was reading the newspaper and he was someway off telephoning someone. There were many people doing that against the windows in the area, presumably to get a good signal, but I feel the image does invite the viewer to find a connection and make up their own story. 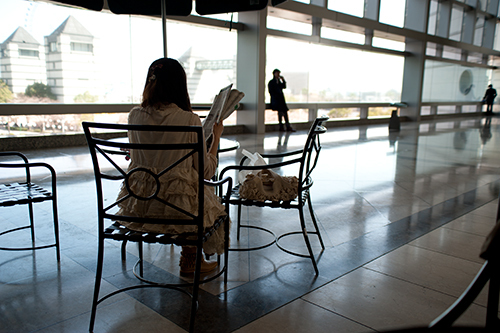 It was taken in the Spring of 2010 on a Nikon D700 with a 24 mm – 70 mm Sigma lens on 32 mm at f/2.8 and 1/500 sec. I created the final image first by cropping to the composition I wanted. I then cloned out various distractions; a plastic bag on the chair (which included reconstructing the chair arm), the object on the table, some of the reflection on the floor which I found distracting, and the pole of a parasol which appeared to be coming out of the top of her head. I then used three Nik Filters, Darken /Lighten Centre (to brighten the image up), Viveza (to desaturate the foliage in parts of the background) and Glamour Glow (which gives the image a slightly dreamy feel). Finally, the image was sharpened using the Photoshop High Pass Filter.